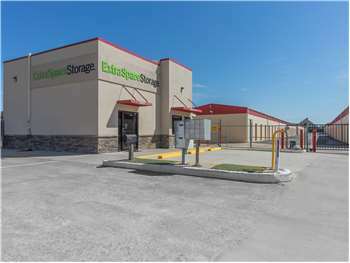 Located just off S Broadway and E Frontage Rd, Extra Space Storage serves residents of Edmond. Locals will recognize our facility north of Volkswagen of Edmond. Are you a college student in Edmond who needs storage over the summer or while studying abroad? Extra Space Storage is about 2.3 miles from Oklahoma Christian University and about 3.2 miles from University of Central Oklahoma, providing an easily accessible option. Extra Space Storage on S Broadway can accommodate residential and commercial storage needs in Edmond with a variety of storage units, vehicle storage, and exceptional security! No matter what you plan to store, our Edmond storage facility can handle it. With units ranging in size from 5x5 to 10x30, it's easy to find the storage space that works for your items. We've equipped our S Broadway storage facility with security measures like an on-site resident manager, 24-hour video surveillance, and electronic gate access to keep your items safe. Looking for secure vehicle storage in Edmond? Extra Space Storage has large outdoor parking spaces and enclosed drive-up units that can easily accommodate cars, boats, RVs, and motorcycles. When you choose Extra Space Storage, you can expect excellent customer service and high-quality self storage. We maintain a clean, secure facility at all times, and our friendly, professional staff is always available to ensure you have a wonderful experience. Contact us today to reserve a storage unit in Edmond! Super friendly and very helpful staff. Extremely clean property. Highly recommend! The account manager and sales associate were very helpful. The facility was clean and the units spacious. Overall, I had a positive experience and would reccomend Extra Space Storage to others. Drive south on S Broadway. Turn left onto E Frontage Rd and continue straight. Our facility will be directly ahead. Drive north on Hwy 77 N. Continue onto S Broadway. Turn right onto E Frontage Rd and continue straight. Our facility will be directly ahead. Drive west on E Memorial Rd. Turn right onto E Frontage Rd. Take a right just before S Broadway and continue straight. Our facility will be directly ahead. Drive east on W Memorial Rd. Turn left onto E Frontage Rd. Take a right just before S Broadway and continue straight. Our facility will be directly ahead.